PASCENDI DOMINICI GREGIS ENCYCLICAL OF POPE PIUS X ON THE DOCTRINES OF THE MODERNISTS To the Patriarchs, Primates, Archbishops, Bishops and other Local. 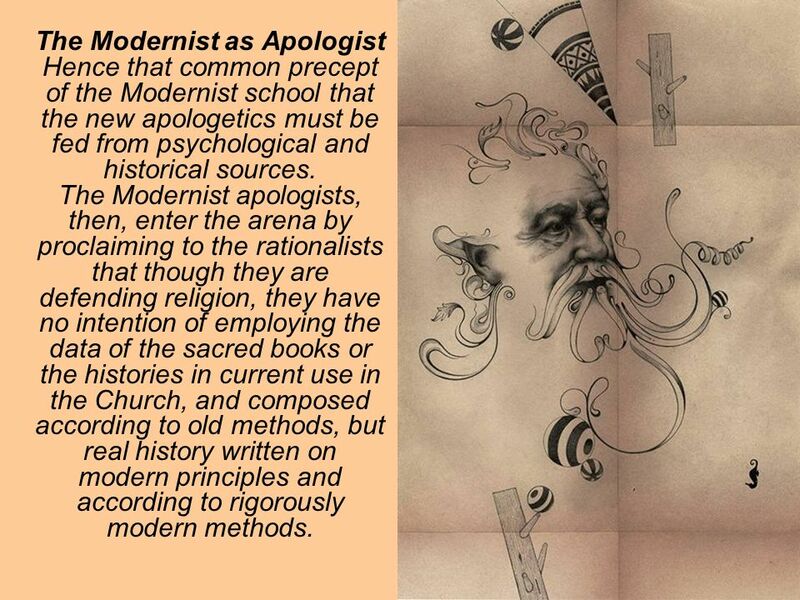 2 The Modernist as Apologist 35. 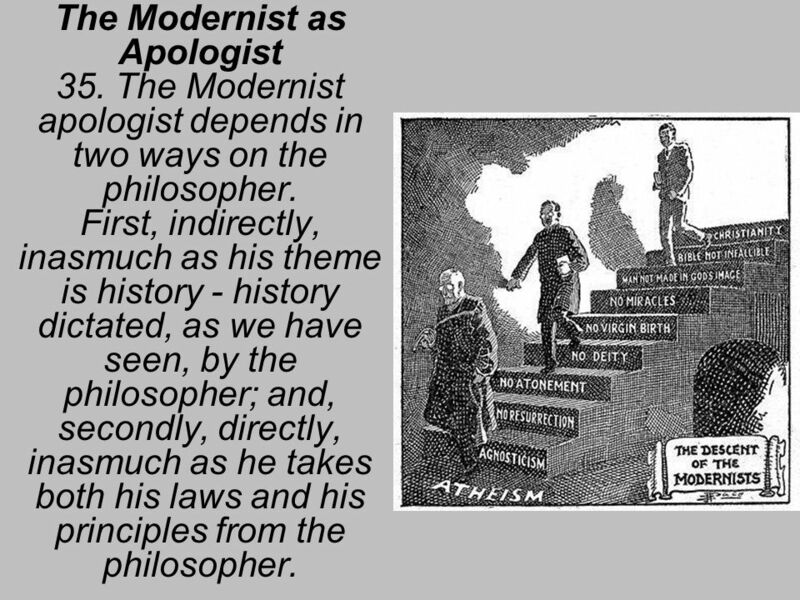 The Modernist apologist depends in two ways on the philosopher. First, indirectly, inasmuch as his theme is history - history dictated, as we have seen, by the philosopher; and, secondly, directly, inasmuch as he takes both his laws and his principles from the philosopher. 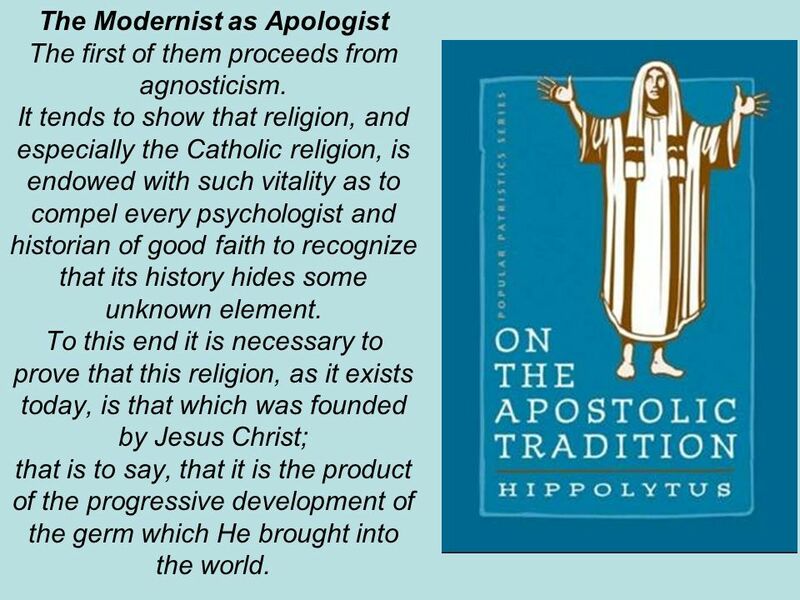 3 The Modernist as Apologist Hence that common precept of the Modernist school that the new apologetics must be fed from psychological and historical sources. 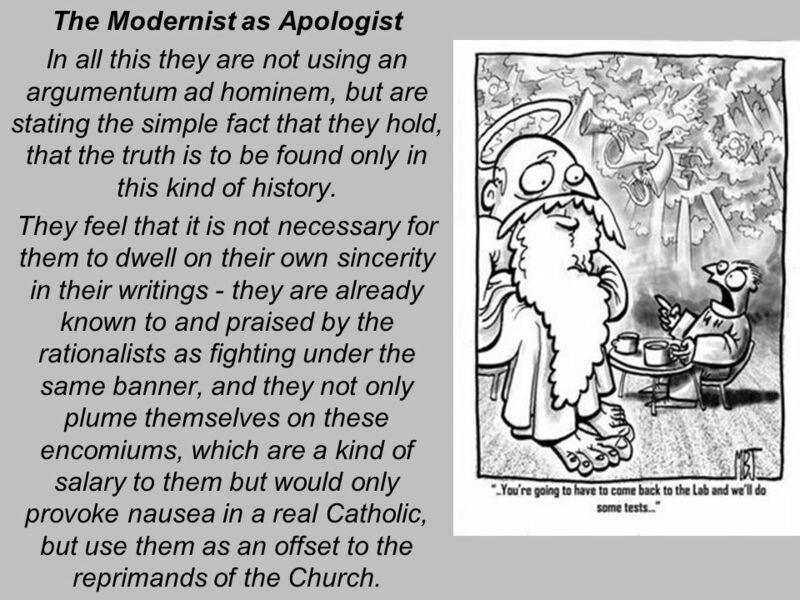 The Modernist apologists, then, enter the arena by proclaiming to the rationalists that though they are defending religion, they have no intention of employing the data of the sacred books or the histories in current use in the Church, and composed according to old methods, but real history written on modern principles and according to rigorously modern methods. 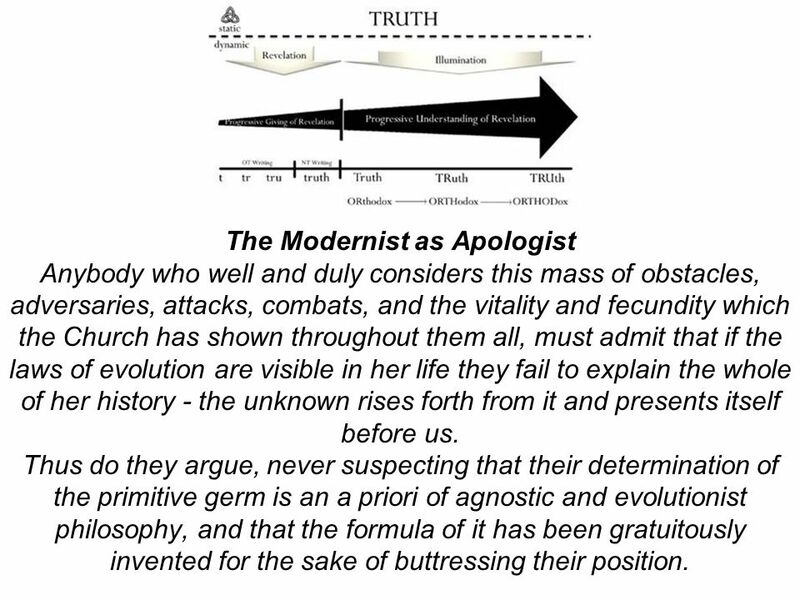 4 The Modernist as Apologist In all this they are not using an argumentum ad hominem, but are stating the simple fact that they hold, that the truth is to be found only in this kind of history. They feel that it is not necessary for them to dwell on their own sincerity in their writings - they are already known to and praised by the rationalists as fighting under the same banner, and they not only plume themselves on these encomiums, which are a kind of salary to them but would only provoke nausea in a real Catholic, but use them as an offset to the reprimands of the Church. 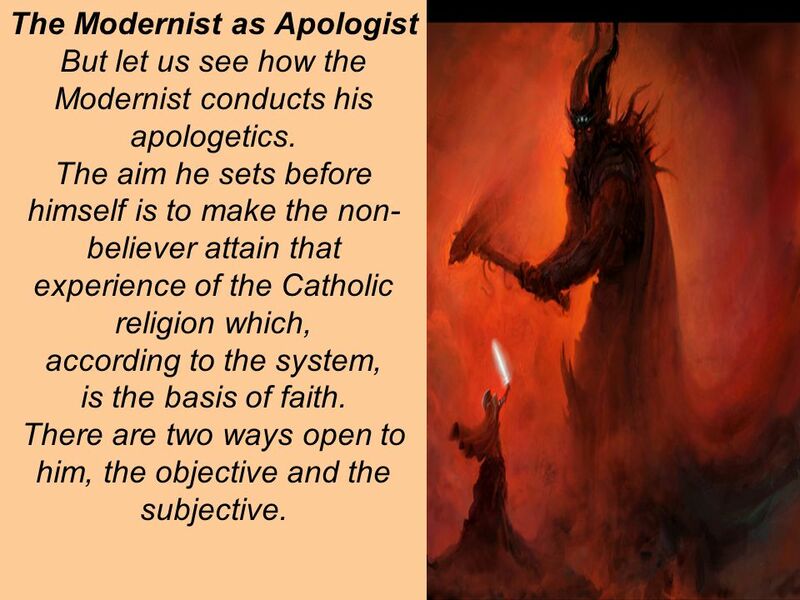 5 The Modernist as Apologist But let us see how the Modernist conducts his apologetics. The aim he sets before himself is to make the non- believer attain that experience of the Catholic religion which, according to the system, is the basis of faith. There are two ways open to him, the objective and the subjective. 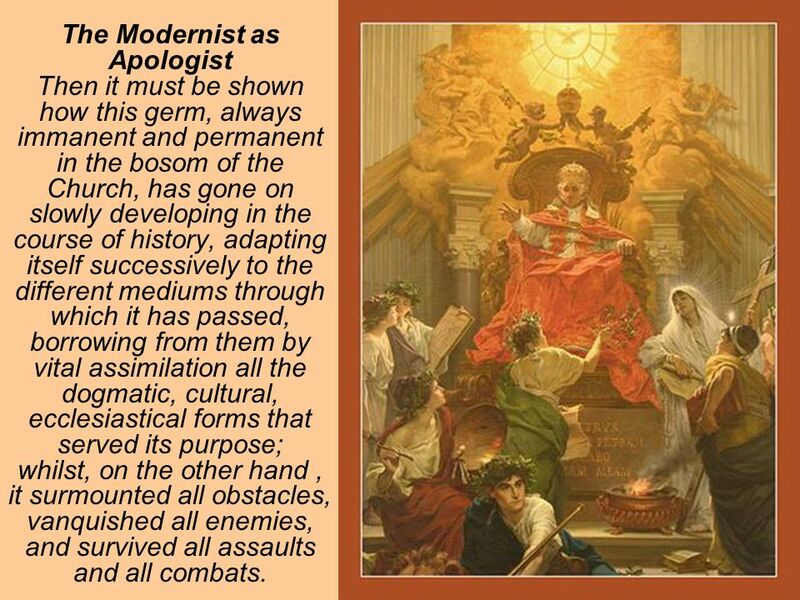 6 The Modernist as Apologist The first of them proceeds from agnosticism. It tends to show that religion, and especially the Catholic religion, is endowed with such vitality as to compel every psychologist and historian of good faith to recognize that its history hides some unknown element. To this end it is necessary to prove that this religion, as it exists today, is that which was founded by Jesus Christ; that is to say, that it is the product of the progressive development of the germ which He brought into the world. 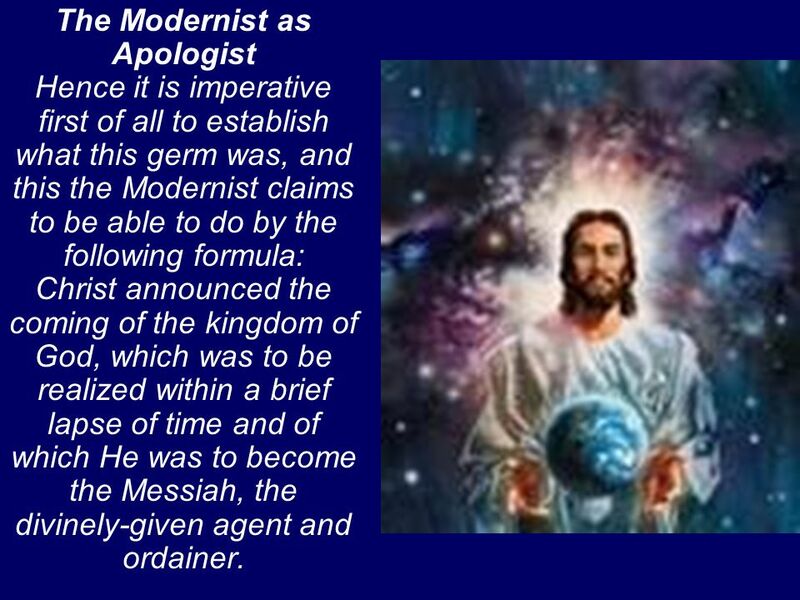 7 The Modernist as Apologist Hence it is imperative first of all to establish what this germ was, and this the Modernist claims to be able to do by the following formula: Christ announced the coming of the kingdom of God, which was to be realized within a brief lapse of time and of which He was to become the Messiah, the divinely-given agent and ordainer. 8 The Modernist as Apologist Then it must be shown how this germ, always immanent and permanent in the bosom of the Church, has gone on slowly developing in the course of history, adapting itself successively to the different mediums through which it has passed, borrowing from them by vital assimilation all the dogmatic, cultural, ecclesiastical forms that served its purpose; whilst, on the other hand, it surmounted all obstacles, vanquished all enemies, and survived all assaults and all combats. 9 The Modernist as Apologist Anybody who well and duly considers this mass of obstacles, adversaries, attacks, combats, and the vitality and fecundity which the Church has shown throughout them all, must admit that if the laws of evolution are visible in her life they fail to explain the whole of her history - the unknown rises forth from it and presents itself before us. Thus do they argue, never suspecting that their determination of the primitive germ is an a priori of agnostic and evolutionist philosophy, and that the formula of it has been gratuitously invented for the sake of buttressing their position. 10 Criticism and its Principles 36. But while they endeavor by this line of reasoning to secure access for the Catholic religion into souls, these new apologists are quite ready to admit that there are many distasteful things in it. Nay, they admit openly, and with ill-concealed satisfaction, that they have found that even its dogma is not exempt from errors and contradictions. They add also that this is not only excusable but - curiously enough - even right and proper. 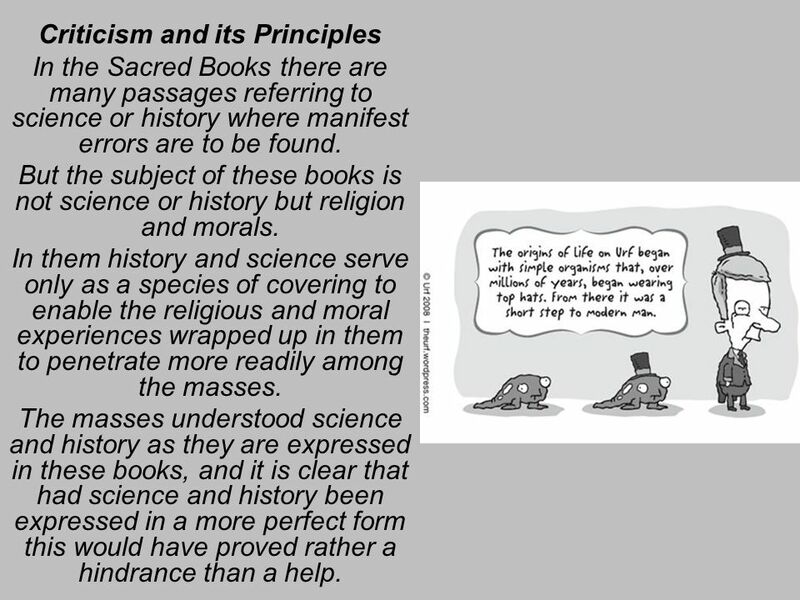 11 Criticism and its Principles In the Sacred Books there are many passages referring to science or history where manifest errors are to be found. But the subject of these books is not science or history but religion and morals. In them history and science serve only as a species of covering to enable the religious and moral experiences wrapped up in them to penetrate more readily among the masses. The masses understood science and history as they are expressed in these books, and it is clear that had science and history been expressed in a more perfect form this would have proved rather a hindrance than a help. 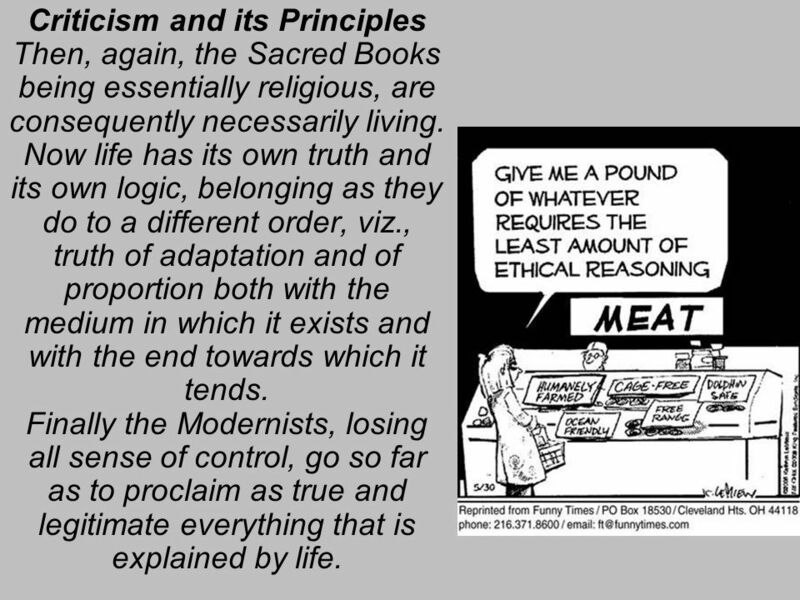 12 Criticism and its Principles Then, again, the Sacred Books being essentially religious, are consequently necessarily living. Now life has its own truth and its own logic, belonging as they do to a different order, viz., truth of adaptation and of proportion both with the medium in which it exists and with the end towards which it tends. Finally the Modernists, losing all sense of control, go so far as to proclaim as true and legitimate everything that is explained by life. 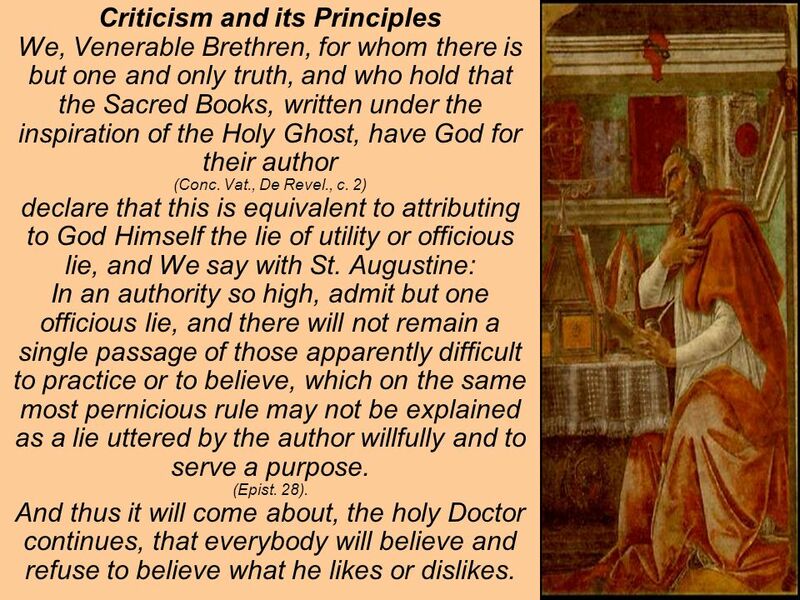 13 Criticism and its Principles We, Venerable Brethren, for whom there is but one and only truth, and who hold that the Sacred Books, written under the inspiration of the Holy Ghost, have God for their author (Conc. Vat., De Revel., c. 2) declare that this is equivalent to attributing to God Himself the lie of utility or officious lie, and We say with St. Augustine: In an authority so high, admit but one officious lie, and there will not remain a single passage of those apparently difficult to practice or to believe, which on the same most pernicious rule may not be explained as a lie uttered by the author willfully and to serve a purpose. (Epist. 28). And thus it will come about, the holy Doctor continues, that everybody will believe and refuse to believe what he likes or dislikes. 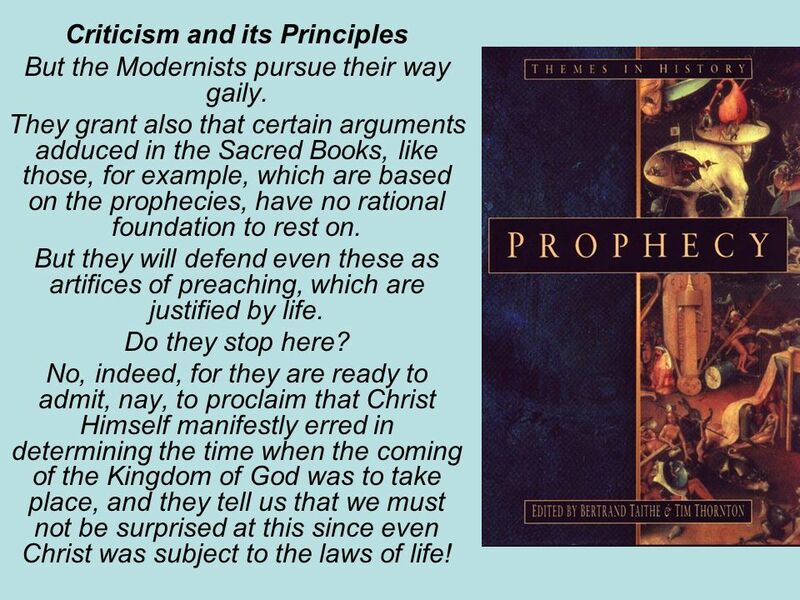 14 Criticism and its Principles But the Modernists pursue their way gaily. They grant also that certain arguments adduced in the Sacred Books, like those, for example, which are based on the prophecies, have no rational foundation to rest on. But they will defend even these as artifices of preaching, which are justified by life. Do they stop here? No, indeed, for they are ready to admit, nay, to proclaim that Christ Himself manifestly erred in determining the time when the coming of the Kingdom of God was to take place, and they tell us that we must not be surprised at this since even Christ was subject to the laws of life! 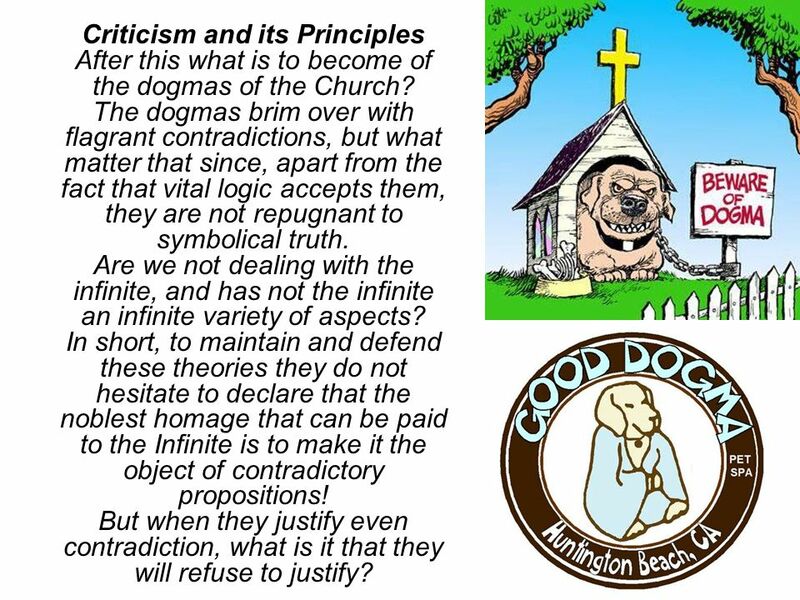 15 Criticism and its Principles After this what is to become of the dogmas of the Church? The dogmas brim over with flagrant contradictions, but what matter that since, apart from the fact that vital logic accepts them, they are not repugnant to symbolical truth. Are we not dealing with the infinite, and has not the infinite an infinite variety of aspects? In short, to maintain and defend these theories they do not hesitate to declare that the noblest homage that can be paid to the Infinite is to make it the object of contradictory propositions! But when they justify even contradiction, what is it that they will refuse to justify? 16 Subjective Arguments 37. 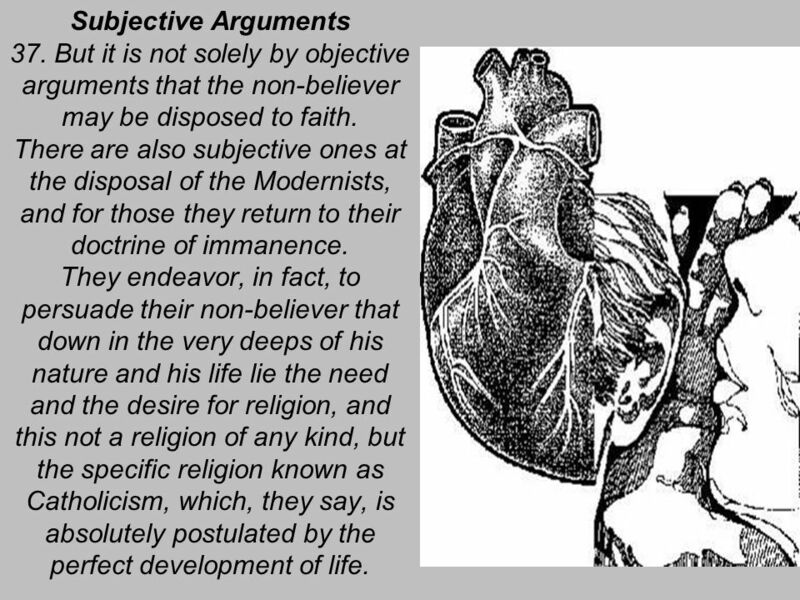 But it is not solely by objective arguments that the non-believer may be disposed to faith. There are also subjective ones at the disposal of the Modernists, and for those they return to their doctrine of immanence. They endeavor, in fact, to persuade their non-believer that down in the very deeps of his nature and his life lie the need and the desire for religion, and this not a religion of any kind, but the specific religion known as Catholicism, which, they say, is absolutely postulated by the perfect development of life. 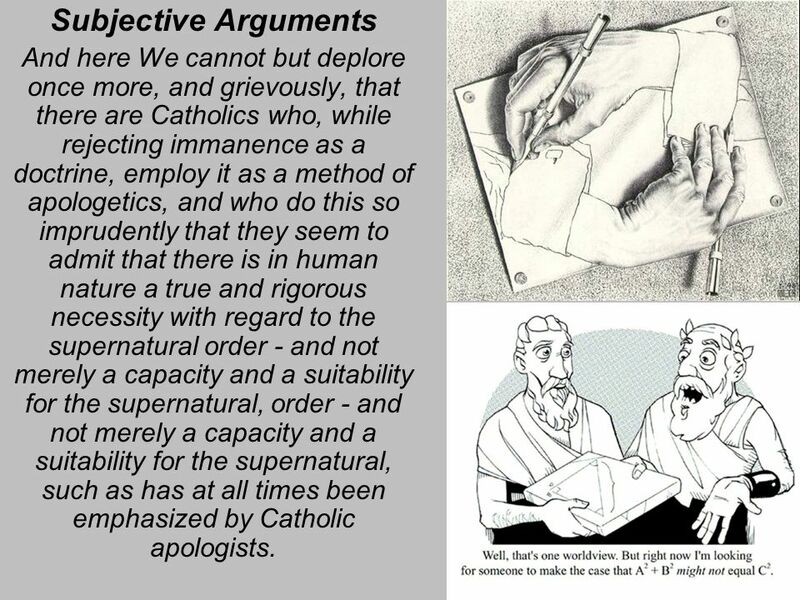 17 Subjective Arguments And here We cannot but deplore once more, and grievously, that there are Catholics who, while rejecting immanence as a doctrine, employ it as a method of apologetics, and who do this so imprudently that they seem to admit that there is in human nature a true and rigorous necessity with regard to the supernatural order - and not merely a capacity and a suitability for the supernatural, order - and not merely a capacity and a suitability for the supernatural, such as has at all times been emphasized by Catholic apologists. 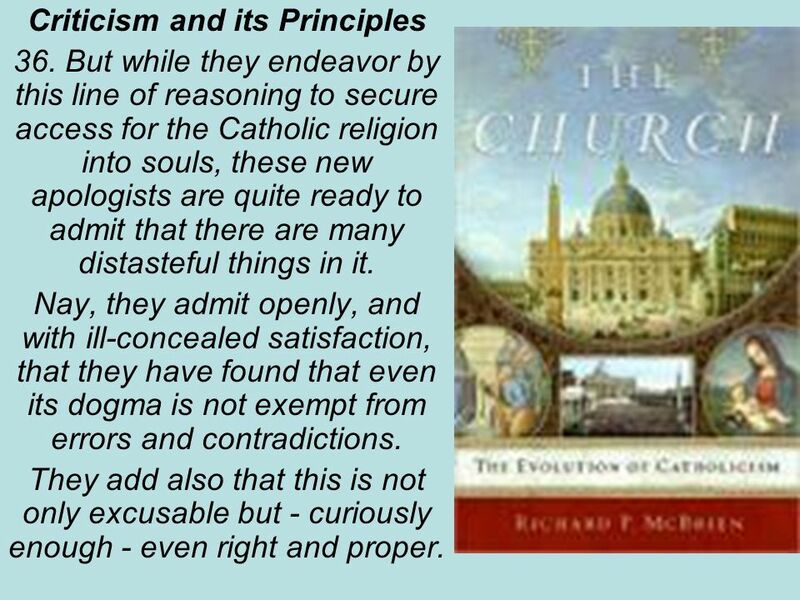 18 Subjective Arguments Truth to tell it is only the moderate Modernists who make this appeal to an exigency for the Catholic religion. As for the others, who might be called intergralists, they would show to the non- believer, hidden away in the very depths of his being, the very germ which Christ Himself bore in His conscience, and which He bequeathed to the world. 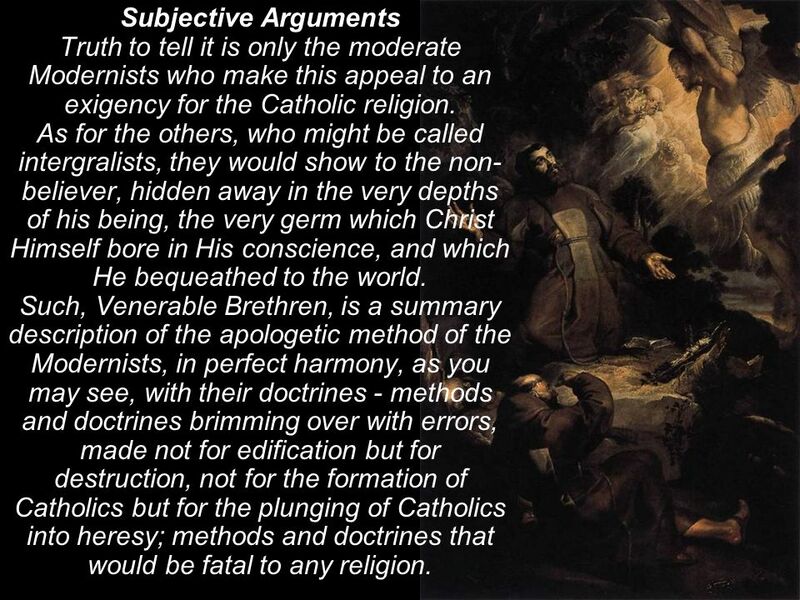 Such, Venerable Brethren, is a summary description of the apologetic method of the Modernists, in perfect harmony, as you may see, with their doctrines - methods and doctrines brimming over with errors, made not for edification but for destruction, not for the formation of Catholics but for the plunging of Catholics into heresy; methods and doctrines that would be fatal to any religion. 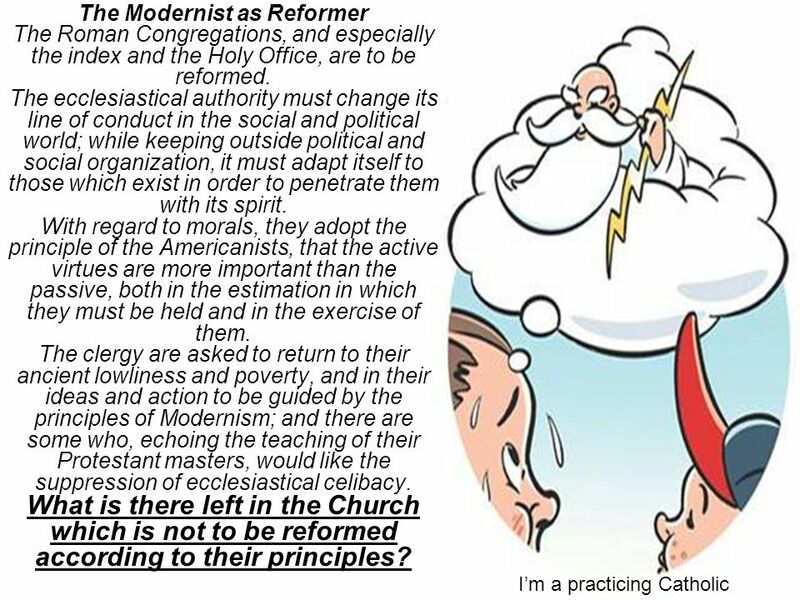 19 The Modernist as Reformer 38. 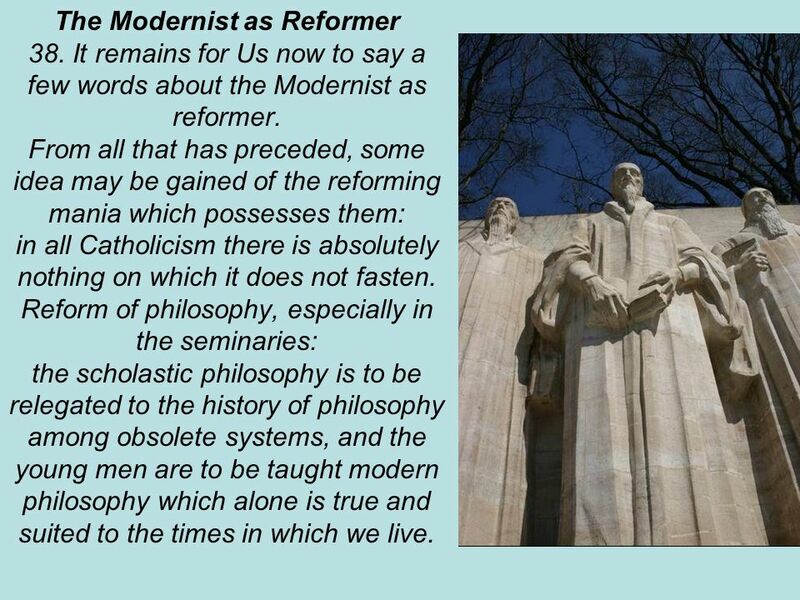 It remains for Us now to say a few words about the Modernist as reformer. From all that has preceded, some idea may be gained of the reforming mania which possesses them: in all Catholicism there is absolutely nothing on which it does not fasten. Reform of philosophy, especially in the seminaries: the scholastic philosophy is to be relegated to the history of philosophy among obsolete systems, and the young men are to be taught modern philosophy which alone is true and suited to the times in which we live. 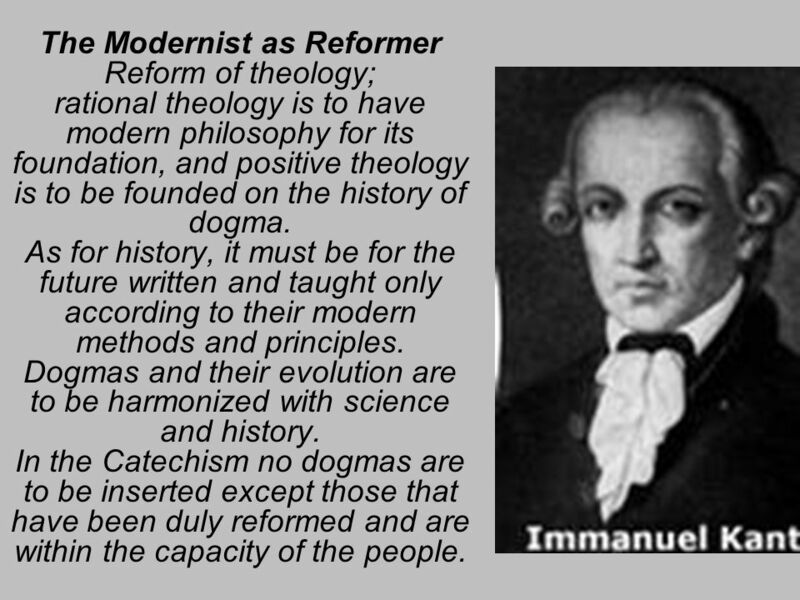 20 The Modernist as Reformer Reform of theology; rational theology is to have modern philosophy for its foundation, and positive theology is to be founded on the history of dogma. As for history, it must be for the future written and taught only according to their modern methods and principles. Dogmas and their evolution are to be harmonized with science and history. In the Catechism no dogmas are to be inserted except those that have been duly reformed and are within the capacity of the people. 21 The Modernist as Reformer Regarding worship, the number of external devotions is to be reduced, or at least steps must be taken to prevent their further increase, though, indeed, some of the admirers of symbolism are disposed to be more indulgent on this head. 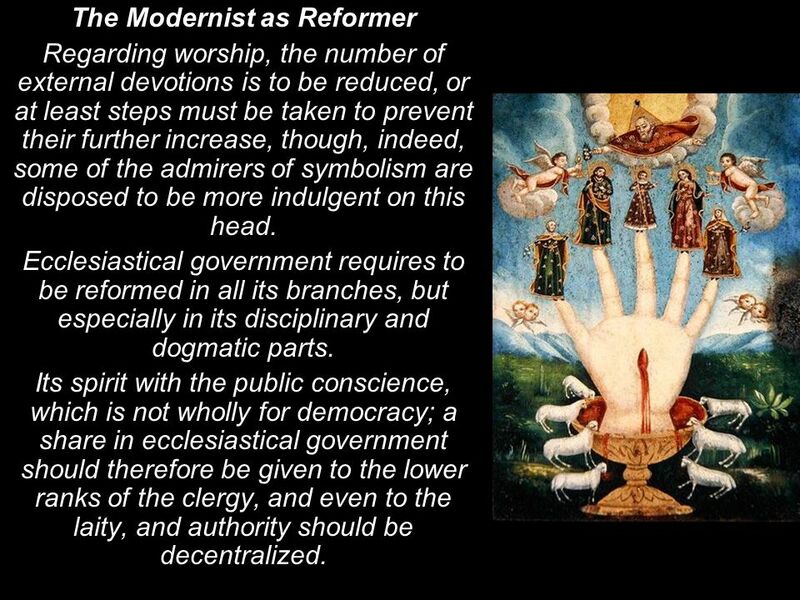 Ecclesiastical government requires to be reformed in all its branches, but especially in its disciplinary and dogmatic parts. Its spirit with the public conscience, which is not wholly for democracy; a share in ecclesiastical government should therefore be given to the lower ranks of the clergy, and even to the laity, and authority should be decentralized. 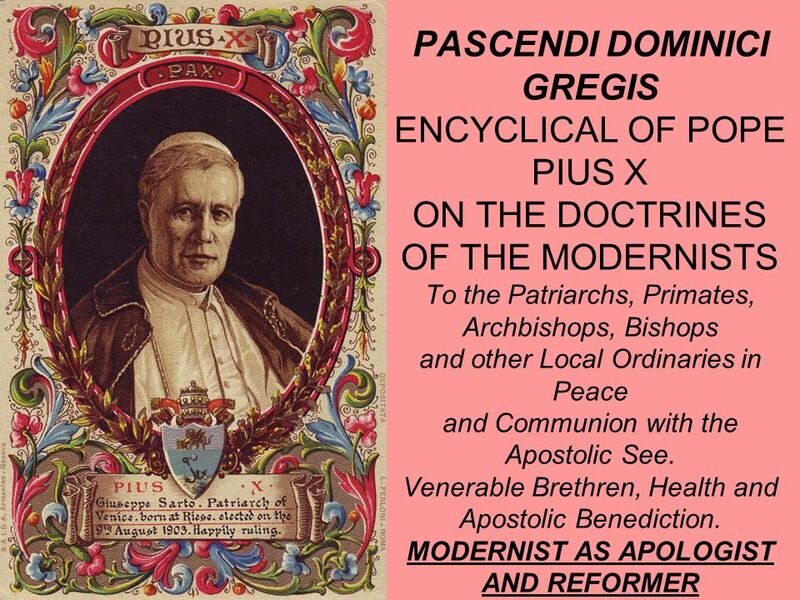 Download ppt "PASCENDI DOMINICI GREGIS ENCYCLICAL OF POPE PIUS X ON THE DOCTRINES OF THE MODERNISTS To the Patriarchs, Primates, Archbishops, Bishops and other Local." In Non-Essentials, Liberty Romans 14:1-15:7 Message 3 in our 4-part series called Growing in Grace Sunday, September 27, 2009 Speaker: Phil Hainaut. I. Divine Revelation Divine Revelation A. Divine Revelation- revealedof Himselfhis plansalvation What God has revealed to us of Himself & his plan, for. Canon Law C and C Can. 321 Christ's faithful direct and moderate private associations according to the provisions of the statutes. Natural Rights ER 11, Spring Natural law/ natural rights Some history, drawing on Finnis article. Chapter Twelve: The Fact-Value Problem Chapter Twelve: The Fact-Value Problem Metaethics ► Philosophizing about the very terms of ethics ► Considering. NOTE: Al Islam Team takes full responsibility for any errors or miscommunication in this Synopsis of the Friday Sermon Sermon Delivered by Hadhrat Mirza. Introduction Of all the doctrines of the Bible, none is more important or foundational than bibliology, the doctrine of the Bible. The reason for this. Canon Law C. 321-326 and C. 327-329 1. Can. 321 Christ's faithful direct and moderate private associations according to the provisions of the statutes.